a basic industrial apparatus for carrying out adsorption. Batch adsorbers and continuous adsorbers are available. through the bottom exit pipe. Desorption sets in after the adsorbent bed reaches saturation, which is determined by the breakthrough of the gas or liquid being absorbed. 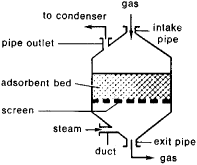 The adsorbent bed is heated by steam, which enters through a duct, so that the gases of the extracted materials are forced out of the adsorbent bed through a pipe outlet for condensation and further processing. The adsorbent is then dried by hot gas and the process resumes after the equipment cools off. Continuous adsorption towers are usually employed in industry; these consist of two or more of the adsorbers described above, which are used alternatively for the adsorption of gas. After the adsorbent bed in the first adsorption tower has been saturated, the stream of gas is switched to the second adsorption tower, so that the first adsorbent bed has time to undergo desorption, drying, and cooling, after which it is used for absorption while the second adsorption tower undergoes desorption, drying, and cooling. In continuous adsorbers, known as hypersorbers, a granular adsorbent travels down a vertical tower with adsorption occurring in the top of the tower and desorption produced by heating taking place in the bottom of the tower. In additon to hypersorbers, continuous adsorbers with a fluidized adsorbent, as in Figure 2, are also used. The walls of the single-stage adsorber supports a distributing screen through which the gas moves upward and converts the fine granular adsorbent into a fluid bed. 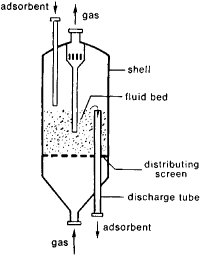 The adsorbent moves continually upward and is removed through the discharge tube for desorption. Serpionova, E. N. Promyshlennaia adsorbtsiia gazov i parov. Moscow, 1956. Romankov, P. G., and V. N. Lepilin. Nepreryvnaia adsorbtsiia parov i gazov. Leningrad, 1968. Initially promoted by filter manufacturers for contaminant reduction/removal of HCP DNA, endotoxin and viruses, these were first applications for membrane adsorbers. De esta forma se han obtenido arcillas modificadas con diferentes propiedades de superficie, que pueden ser empleadas para adsorber diferentes tipos de compuestos dependiendo de su afinidad quimica. After the adsorption phase and desorption phase are finished in the adsorbers, the heat from the hot adsorber is transferred to the cold adsorber by circulating heat transfer fluid between them in a closed loop. Because the two adsorbers (Figure 1) operate alternatively between the adsorption and desorption phases, the performance of one adsorber and the heat exchanger (either condenser or evaporator in Figure 1) connected to the adsorber is illustrated. As shown in this figure, the system begins the process when Adsorber 1 is heated by the exhaust gas released from the engine. eff] for the fixed bed adsorber are shown in Table 1, and results with a 100% [Al. NOx trap systems, also referred to as NOx adsorbers, are an EPA-preferred approach to meeting the EPA's 2007/2010 NOx emissions regulations. One other trick that has proven very successful is to treat with the coagulant and then follow with about 5-10 pounds per ton of an adsorber such as talc," King continued. This work concerns the purification of contaminated groundwater by means of granulated activated carbon in a packed bed adsorber. drums has been introduced which will adsorb any water vapor drawn into a drum during filling and emptying, and will continue to protect the fluid until the adsorber is exhausted. The clean adsorbent is then returned to the adsorber, while a stream of air in which styrene has been concentrated 20-fold flows from the desorber to a catalytic oxidizer. Examples of systems or process include, packed bed reactors, either single phase or multiphase, absorber and adsorber separation columns, filter beds, plate heat exchangers, flow of viscoelastic fluids in polymer systems, or the enhanced recovery of oil, among others.